How Much Compensation Can I Claim For A Ladder Injury? A ladder is a useful tool and an essential part of many workplaces, from factories to offices. But it can cause accidents. Falls from ladders (and height in general) are one of the leading types of accidents, either at work, at home, or in a public place. Injuries sustained in such accidents can be very serious. For employees, the Work at Height (amended) Regulations 2007 provides some protection in situations where you might fall from a height. If you have had an accident involving ladders, these regulations might allow you to make a ladder accident claim and win compensation. In public environments, the occupier might have a similar duty of care. Following accidents at home, the manufacturer of the ladder might be at fault. There are many ways in which you can suffer an injury caused by a ladder accident. Similarly, there are many ways in which you can make a claim for compensation. This guide aims to help you learn more about your ladder accident claim. If you’re interested in legal options, it might be the best place to begin your case. See the HSE defined laws for working at height for more detailed information. A guide to claiming for an injury sustained in a ladder accident. 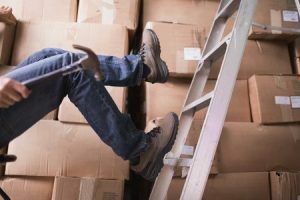 What is a ladder accident injury? Claiming for ladder accidents caused by damaged or faulty ladders. Claiming for ladder accidents caused by incorrect use of ladders. Claiming for ladder accidents caused by overreaching. Other common causes of ladder accidents. Claiming for a ladder accident as an employee. Claiming for a ladder accident as a member of the public. Ladder accident injury facts and statistics. Assessing the severity of an injury caused by a ladder accident. The long-term effects of an injury caused by a ladder accident. What to do if you have suffered an injury caused by a ladder accident. What can be claimed for after a ladder accident causing an injury? No win no fee ladder accident claims. How much can I claim for an injury sustained in a ladder accident? How to start a ladder accident injury claim. Why choose us as your claims service for an injury caused in a ladder accident? According to the Health Safety Executive (HSE), falls are among the most common causes of injury-related death in the UK. In the food and drink industry alone, at least 40% of falls from height accidents in the last three years involved ladders. A lot of people work in organisations where ladders are required to complete various tasks. This is why the government introduced the Work at Height Regulations of 2005, protecting employees from potential injuries resulting from ladder accidents. As stated by the Work at Height Regulations, employers are expected to provide good ladders and offer adequate training to their employees on how to use the ladders correctly. In the event that a faulty or wrongly placed ladder causes an employee to fall and sustain injuries, the employer may be deemed negligent under the law and the employee may be able to claim ladder accident compensation from the negligent employer. However, a ladder accident claim is not always so simple. In this guide, you would find all the information you need to be able to claim for a ladder accident, including details about different types of ladder accidents, how to assess the severity of an injury, the steps to take after an accident and how much you can get as compensation for a ladder accident at work. The UK Government has published more detailed info on falls at work. Ladder accident injuries can take many forms. Typically, however, they involve a fall from an elevated height. This could be due to the ladder slipping, faulty equipment, or poor training. As we will see in a later section, such accidents can happen for a variety of reasons. Ladders are frequently used in construction, manufacturing, catering and hospitality, and other similar industries. Any subsequent ladder accident injuries can include bruises, broken bones, leg injuries, arm or shoulder injuries, back injuries, head injuries, internal organ injuries, or any other injuries directly or indirectly caused by a fall from a ladder. Additionally, these accidents may also involve emotional trauma, psychological effects, and financial losses sustained by the victim as a result of the accident. One of the most common causes of ladder accidents is the use of damaged or faulty ladders. Ladders, just like any other work tool, have an estimated useful life. After this time, it may be unsafe to continue using them. Ladders are also subject to wear and tear from the frequency of usage and the weight of the people that the ladder has to support. When a ladder has become weak or damaged due to prolonged use, the ladder may lose its support factor and cause users to fall and injure themselves. If you have been involved in a ladder-related accident (and have suffered an injury as a result) you may be owed compensation. Claiming for compensation following such an accident will likely depend on demonstrating the negligence of another party. For example, those who have been injured in the workplace may have a right to claim compensation from their employer, who may have failed to follow health and safety regulations and provided employees with a ladder which was not functional or was poorly maintained. If you are interested in making a claim for compensation following an accident, get in touch with a law firm and discover more. Knowing how to use a ladder is important. If you are employed in a situation where you may need to use a ladder on a regular basis, your employer should provide you with instructions on how to do so in a safe manner. It is important that training is provided in order that staff members are able to use the ladder as intended. This could also include information on the correct type of ladder to use in a particular situation, on how the ladder functions, and how to ensure that the ladder is placed on a firm, proper foundation and is not prone to slipping. If this training is not provided, the employer can be deemed negligent and any injured parties may have a legitimate claim for compensation. Another major cause of ladder accidents is over-reaching. Reaching too far to the side or above the ladder can lead to a loss of balance, causing a fall and – potentially – a serious injury. Commonly, this can occur as the result of a person using the incorrect ladder for a specific task. Among the industries most affected by this particular problem is the construction industry. In the case of overreaching, the employer may be held liable if they did not provide the right type of ladder for the task at hand and left the employee with no other choice but to overreach. They also might be liable if they failed to provide training and information regarding the dangers of overreaching while using a ladder. Inclement Weather: If ladders are used during bad weather conditions (like high winds or a storm), the risks of a person falling from their ladder can be higher. Employers may be held liable for ladder accidents caused by bad weather as they are expected to order employees to stop work when the weather is bad or to take necessary steps to protect them from accidents. Wrong Ladder Placement: Ladders are supposed to be placed on solid, firm surfaces. If the base of a ladder is placed on a wet, soft, or slippery surface, it may cause the ladder to slip during use. The decision as to who would be held liable in such a case could depend on whether the employee received proper training and instructions on how to place a ladder. Lack of Protective Gear: When climbing a ladder, employees are expected to wear protective gear such as helmets, knee covers, boots, and other protective clothing in order to minimise injuries in case of a fall. Failure to wear protective gear when working on a ladder could cause injuries to be more serious. The employer may be held liable if they fail to provide protective gear for their employees while the employee may be deemed negligent if they simply failed to wear it during work. Failure to Lock the Ladder: The hinges of a ladder should be locked before the ladder is mounted. When the hinges are not locked, the ladder may slip and serious injuries could occur. This can be covered under typical health and safety training. Standing at the Top of the Ladder: The top step of the ladder is not intended for standing; it’s designed to make it easier to get the ladder closer to the wall. Standing on this part of the ladder may lead to accidents because it is not as strong as the others parts of the ladder. Any of the above issues may lead to an accident and, in turn, to a serious injury. Likewise, they are all matters which should be guarded against by an employer. When a job requires an employee to work at a height using a ladder, the employer is responsible for taking necessary precautionary steps to minimise the risks of accidents. Should the employer fail to do so, workers who sustain injuries from a ladder accident at work are able to make claims for compensation. To be able to make a successful claim as an employee, you would have to prove that the accident was caused by the negligence of your employer or another person other than you. The employer failed to properly assess the risks associated with using a ladder for the work. The employer provided a damaged or faulty ladder to be used for the work. The ladder was not subjected to adequate safety checks. The employer failed to properly and adequately train the employee on how to use the ladder. The employer failed to minimise risks by introducing a safer work system. For instance, where scaffolds and other safer equipment can be used instead of ladders. The employer provided a ladder that was not appropriate for the task. The employer failed to provide necessary protective gear, such as harnesses and other fall protection equipment. In addition to an employer, the manufacturers of the ladder may also be held partly responsible for ladder accidents in the event that the ladder breaks or functions incorrectly. This could occur in the event that the manufacturer failed to provide adequate instructions on how the ladder should be or should not be used; if they provided misleading information about the weight capacity, sturdiness, or other important information about the ladder; or if they manufactured a ladder with defective parts. Such cases are less common but it is important to acknowledge their existence when discussing a potential case. Speak to a law firm for more information on who might be considered negligent after an accident at work. Accidents involving both ladders and members of the public are not uncommon. These accidents may not only affect the person who mounted the ladder but may also affect people on the ground and in the immediate vicinity. A typical example is when the ladder slips and falls on a passer-by, injuring them in the process. It is possible to make a claim for injuries sustained as a result of ladder accidents if you are a member of the public, providing the accident occurred through no fault of your own. The use of warning signs and other protective measures in a public place are just one way in which an occupier of a property can protect members of the public from such injuries. If these are not present, there may be a case for a compensation claim. If you have been involved in such an accident, we recommend discussing the matter with a law firm as soon as possible. the largest single cause of accidents at home and at the workplace in the UK. the reason why roughly 48,000 people are admitted to Accident and Emergency departments of various hospitals around the country every year. most commonly caused by overreaching or not properly securing the ladder. responsible for at least 14 deaths every year in the UK. able to benefit from the use of ladder grips, which can improve the stability of a ladder by at least 350%. costing the UK economy approximately £60million every year. Being aware of these facts can bring the widespread issue to your attention when considering legal action. During the claims process, one of the factors that will be considered before awarding compensation is the severity of the injury. Ladder accidents are typically classified as mild or severe. Minor Injuries: Minor injuries include bruises, cuts, sprains and abrasions caused by the accident. These types of injuries are usually easier to treat and have little or no long-term consequences on the health of the victim. Severe Injuries: Severe injuries can include Internal organ injuries, concussions, fractured bones, head injuries, arm and leg injuries and injuries that may lead to amputation or permanent disabilities. Compensation amounts awarded for severe injuries are usually higher than those awarded for minor injuries. Ladder accidents can have serious long-term effects for victims. Many victims have a hard time adjusting to life after a ladder accident. Some become more dependent on assistance and require care and support from other people to be able to live a normal life. Some victims may also have to quit their jobs or suffer from brain damages, back pains, Post-Traumatic Stress Disorder (PTSD), acrophobia, bone damage, and other bone diseases. Victims may also suffer from emotional and psychological effects as a result of the accident and would require long term treatments and rehabilitation to be able to live a normal life. Compensation can help to minimise these effects. However, it is important that a full diagnosis is made. When we work with clients, we arrange for a local medical appointment to thoroughly diagnose all potential long-term health complications following an injury. Obtain Photographic Evidence: photographic evidence of both the scene and your injuries can be useful in proving negligent behaviour during a court case. Get Witness Statements: witness statements can strengthen your claim. Taking contact details from witnesses allows you to reach out to them at a later date. Report the Incident: if possible, make a formal report of the incident both at the police station and at the premises where you sustained the accident. Get an Expert Opinion: a report from a medical professional detailing the current situation and long-term effects of your injury can serve as a strong backup for your claims. Document Financial Losses: keep receipts of all expenses related to treatment and management of your injuries as this will help to determine the final compensation amount. You may not be able to do all of these on your own after the accident. However, taking any (or all) of the above evidence to a legal professional can provide an excellent foundation for your compensation claim. General Damages: General damages are awarded for the pains and suffering caused by the accident, as well as any emotional and psychological effects of the accident. Loss of Earnings: If you have to quit your job or lose your source of income or pension because of the injuries you sustained in a ladder accident, you may be able to claim for it. You may also be able to claim for temporary loss of earnings during the period of recuperation. Medical Expenses: Medical expenses would cover for all treatments, medicines, and surgeries you had to undergo. Travel Expenses: Transportation costs and travel expenses, such a fuel costs for visiting out of town doctors. Rehabilitation Expenses: Rehabilitation expenses include physical therapy costs, training expenses, costs of wheelchairs, and other facilities that would help you cope and live a better life after the accident. Hospice and Assisted Care: If you had to be admitted to a hospital or had to be cared for by friends and family, these costs can be recuperated. Funeral Expenses: If the ladder accident resulted in fatal injuries, the victim’s family can also make claims for funeral costs. It is important to document all expenses incurred during treatment and rehabilitation as they might also be required as evidence during the claims process. We understand how painful and frustrating a ladder accident injury can be and that is why we offer a ‘No Win No Fee’ service for all ladder accident injury claims. With this Conditional Fee Agreement (CFA), you would be able to start your claims process without the financial risk or uncertainty that affects many people. It can help you be more certain of your chances of winning while bringing fantastic legal support for your case at the same time. How Much Can I Claim for an Injury Sustained by a Ladder Accident? Every ladder accident injury is different. As such, it can be difficult to give an accurate estimate of how much money you will get as compensation. The severity of injuries, the long-term effects of injuries, and the current and future financial implications of each ladder accident are all considered before compensation is awarded. However, the table below can give an indication of amounts that are typically awarded as compensation for the injuries you might suffer as the result of a ladder accident. During your free consultation session, our ladder accident claims experts will be able to give you a more accurate idea of what you may be able to receive as compensation in your own case. Our ladder accident injury claims process is designed to be simple and stress-free for all our clients. It starts with a free consultation session and, during this session, our experts will be able to review all the evidence related to the accident. This will help us to understand your case and enable us to offer specific advice. We will also be able to advise you on the next steps to take to make a successful claim and give you a clear idea of how much you should expect as compensation. Expert opinion from a qualified and certified medical professional is one of the requirements for making a claim. If you don’t already have this, we can arrange for a local medical professional to perform an examination and issue a medical report that would be used to back your claims up. It all begins with one phone call to our offices, making the entire claims process that much easier. There are dozens of injury claims experts but our law firm stands out from the rest. We have been in business for years and, during this time, we have helped countless people get compensation for different injuries, including ladder accidents. We understand just how much pain and emotional suffering a ladder accident can cause, which is why we always put our clients’ needs first. Our main objective is helping you get the highest amount of compensation possible, using a ‘No Win No Fee’ approach to help minimise the financial risks and eliminate any further losses. Our team of experts are friendly, empathic, and attentive. We can provide expert and informed legal advice, exactly the kind of support you would need when making a ladder accident injury claim for yourself or for your loved ones. If another person’s negligence has caused you to sustain injuries as the result of an accident involving a ladder, you may have a viable claim for compensation. To find out more, you can either use the chat function or the contact form on our website or you can call 08000738804. When you need legal assistance, we’re here to help. Find out if you can make a no win no fee personal injury claim against your employer. Have you had a slip trip or fall at work? get free legal advice and see if you can claim today.